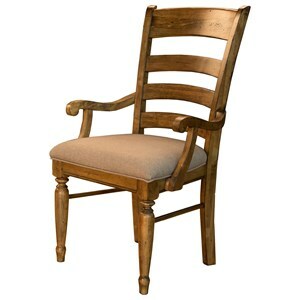 Complete your dining room with this classic slat back arm chair. An upholstered seat, arms, and slat-style back offer comfort and support for you and your dining guests. The casual and simple frame is constructed from Mahogany wood giving it a naturally romantic look. The Sundance Slatback Arm Chair with Upholstered Seat by AAmerica at Rooms and Rest in the Mankato, Austin, New Ulm, Southern Minnesota area. Product availability may vary. Contact us for the most current availability on this product. Fabric Content Antiqued espresso brown bonded leather. 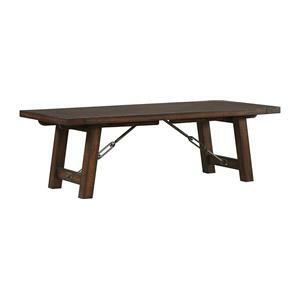 Add a rich hand crafted look to your home with this collection of mission style occasional tables and dining furniture. 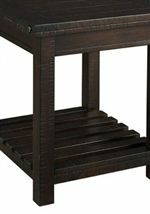 Expertly constructed from solid mahogany originating from sustainable plantation lumber, each piece is built with superior detail and construction. 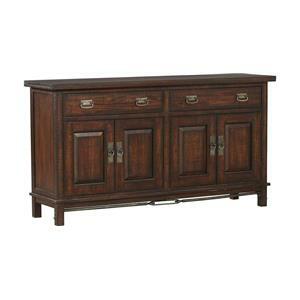 Bathed in a dark mahogany finish these pieces will give a hearty, rich look to your home with. Select pieces feature dark gunmetal finished drop pulls and metal stretchers to give the simple designs an industrial appeal. The Sundance collection is a great option if you are looking for Industrial Mission furniture in the Mankato, Austin, New Ulm, Southern Minnesota area. Browse other items in the Sundance collection from Rooms and Rest in the Mankato, Austin, New Ulm, Southern Minnesota area.